The Siliskin® Straw Cup is 100% silicone with an embedded stainless steel ring. 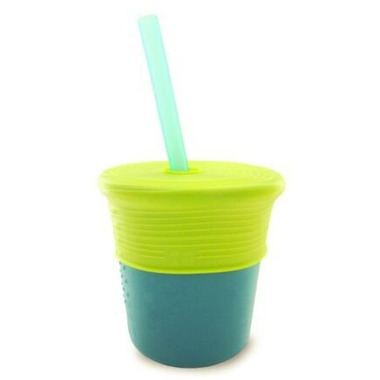 It won't collapse when gripped and the universal silicone straw top prevents big spills. Seriously the best cup on the market! Perfect for smoothies, all beverages, the nightstand, tabletop, indoor and outdoor use! Comes as full set with cup, universal straw straw top and reusable silicone straw. Love this cup because itâ€™s a great alternative to plastic and safer than glass. Weâ€™ve started using it at 14mo and yes my lo does pull the straw out and yes itâ€™s messy if itâ€™s a smoothie but theyâ€™re supposed to be learning how to drink on their own with a straw and eventually just a cup and this product does just that. 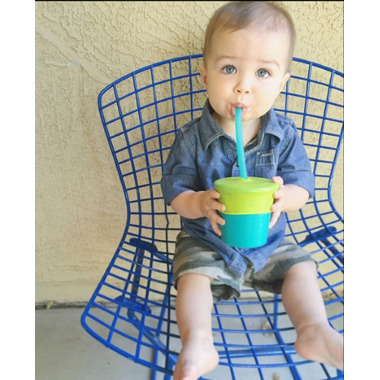 At 18mo my lo stopped making a â€œmessâ€� with it - pulling out the straw lost its appeal. I want to give this product 3/5 but that wouldn't be fair because it's not the designer's fault. I expected this cup to be spill proof. But it only prevents MAJOR spills but there are still MINOR spills. So it kinda defeated my main purpose for buying this product. If I wanted something spill proof then I should've stick to the straw sippy cup. This is more of a big kid kinda cup. My daughter is 19m and she's still clumsy because she walks and climbs with the cup in her hand. She also likes to pull out the straw just like the previous post. The good thing about this product is that it's easy to clean and the lid is stretchable. The cup and straw is good quality and reusable. The quality of th cup is excellent. I would not recommend for a young baby. My 12 month old daughter is able to pull out the straw and make a mess. A cup with a straw affixed to the lid is more suitable for a baby her age.